We can begin with the “Labneh”, which is a tangy thick, creamy yogurt cheese. Like Greek yogurt, the Labneh comes to fruition by straining the liquid out. Labneh can be served in various ways. It can be spread on sandwiches, like cream cheese. However, the best way to serve is the Middle Eastern way. Spreading it in a bowl with olive oil smoothly poured in the middle, and adding a sprinkle of za’atar or herbs with warm pita bread on the side. Another Lebanese dish is Spinach Fatayer. Think of a little pie, filled with spinach. A wonderful classic filling that can be served warm or room temperature as an appetizer, or for a meal with a salad. The great thing about Lebanese food is that there is a balance of yummy goodness. Ranging from desert to appetizers, to main courses. Ashta, a dessert to sweeten your day and possibly life. Traditionally served for dessert, or as a topping fresh fruit. It’s creamy and without any eggs. The milky pudding helps allow the flavor of the ashta to shine. What is your favorite Lebanese dish? What about your favorite Lebanese dessert? 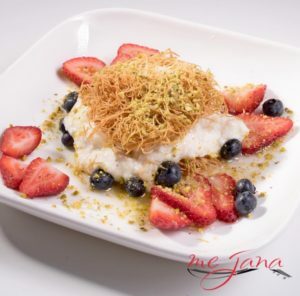 Do you and your taste buds a favor and experience the fine Lebanese cuisine at Mejana! 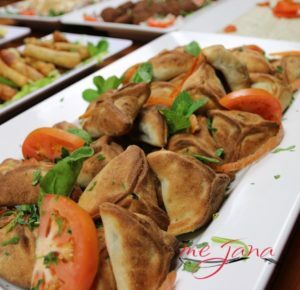 We have mastered the art of true Lebanese Cuisine, join us and see for yourself!